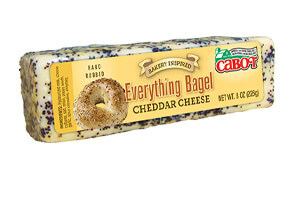 A classic Cabot cheddar cheese with a hand-rubbed mix of the flavors of an everything bagel. You don't really need bread or crackers do enjoy this cheese, just cut off a slice and you good to go. The rub consists of onion, garlic, and poppy seeds. Ingredients:pasteurized milk, cheese cultures, salt, onion, poppy seeds, garlic, spice extractive, enzymes. Excellent cheese. Please send to Wisconsin. Tried this the first time on a recent trip to Vermont. Outstanding cheese. Can't wait to get it locally.